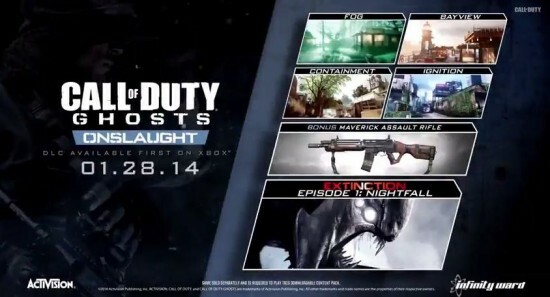 Yesterday, Activision gave the first detailed glimpse at Onslaught, the first DLC pack for Call of Duty: Ghosts. As has become the standard, the pack will include four regular multiplayer maps, one new weapon and one survival map, this time for the Extinction game mode. As you’ll see in the trailer after the break, the multiplayer levels are more goal oriented than ever before with a “reward” system that looks to really change the dynamic of each individual match. The most exciting new map has to be Fog. A dark and spooky backwoods map with cabins and a barn, the real excitement comes from the completed field order which turns a player into Michael Meyers. Yes, from Halloween. When you’re Michael, you get armed with an axe… and his signature theme music. When you get close, your victim knows it’s coming and hear it before you take them out. 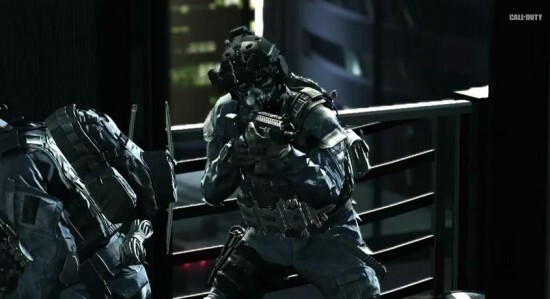 As we get close to the release of Call of Duty: Ghosts, the next installment in the hugely successful franchise, we’re getting more and more info about the game pretty much every day. This time said info comes in the form of a new “Squads” trailer. What is this “Squads” thing you may wonder? Well, read on. Squads introduces a whole new level of competition to Call of Duty: Ghosts. Combining the unrivaled Multiplayer experience with cutting edge AI, Squads lets you play a variety of new game modes with your customized squad-mates. Play solo against another player and their squad, or cooperatively with friends, competing versus an AI-controlled squad. Best of all, the XP earned in Squads is directly connected to your Multiplayer progress! Got it? Good. 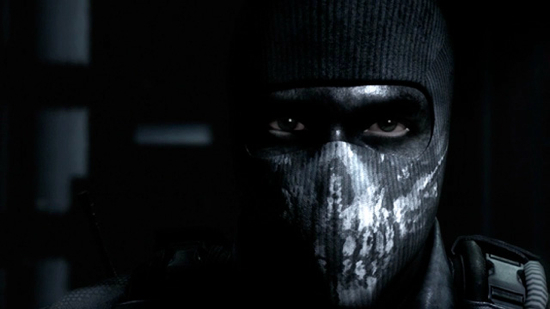 Look for Call of Duty: Ghosts to arrive on November 5. Check out the new trailer after the break. Yesterday, we revealed the Call of Duty: Ghosts preorder bonus tied to the upcoming Marshal Mathers 2 LP from Eminem but today we have the big reveal. Yesterday, Activision graced us all with the first look at the Call of Duty: Ghosts single player campaign. While it’d be easy to go to the joke that all the meme creating trolls online made about there being such a focus on the dog in the reveal trailer, it’s hard to not take a look at this campaign trailer and not think the whole thing looks pretty bad @$$. Honestly, if you haven’t seen the trailer yet. I don’t want to spoil it for you before you take a look at it below. It isn’t because there is some critical plot point or a trailer like you’d see for a movie where they reveal the whole thing but because there are some moments that are just damn impressive in it. And yes, you see the dogs too. Since Call of Duty: Black Ops, Eminem has found himself drawn into the Call of Duty series. As some of you may remember, our own Christ Ulrich got to see Eminem live on stage at the Activision event before E3 just a few years ago to go along with his song that was tied to the game. Three years later, Eminem has a new album coming out coincidentally on the same day that the new Call of Duty: Ghosts is releasing and that left the door for a collaboration between the two media powerhouses. Anyone who preorders Call of Duty: Ghosts from GameStop will receive a code to get Eminem’s The Marshal Mathers LP 2 at a reduced price of $8.99 along with an exclusive track as well. 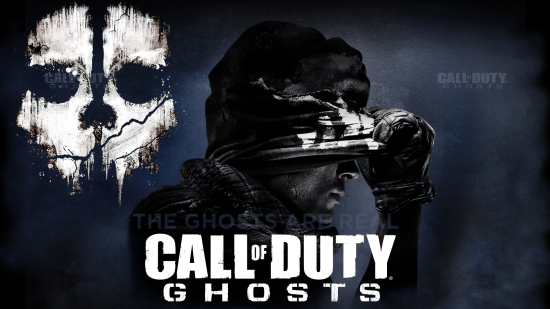 It is possible that Call of Duty: Ghosts may set the record for highest selling game as franchise tradition continues, especially with the game launching on more systems with the next gen coming out. Preorder numbers are already shooting through the roof with Call of Duty: Ghosts ranked first for games for the XBox One and third for the PlayStation 4 currently (since real console shooter players stick to the XBox platform). 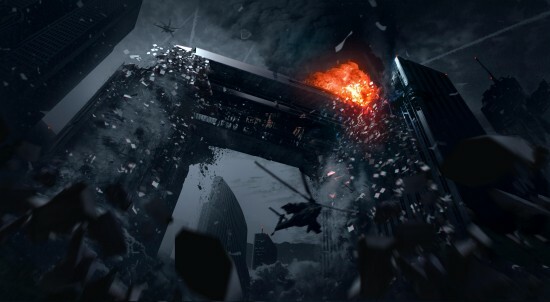 In spite of that, Activision is announcing a preorder incentive for Call of Duty: Ghosts in the form of a bonus map called Free Fall which will dynamically change as the game progresses. Check out the full press release below as well as concept art as well. Call of Duty: Ghosts is due out this fall for the XBox One, XBox 360, PlayStation 4, PlayStation 3, PC and Wii U on November 5th. Unless you’ve been living under a rock or on a remote island somewhere, you likely know about the Call of Duty video game franchise. It’s been, to say the least, amazingly successful with the last installment, Black Ops II, being on of the most successful games of all time. Naturally, when there’s been succes of this magnitude, you can expect another game in the franchise to come along in shor order. Said game has now been announced and it’s called Call of Duty: Ghosts. And as if that wasn’t enough, the guys who created the game in the first place and were responsible for my favorite installment, Modern Warfare, are back on board for Ghosts. 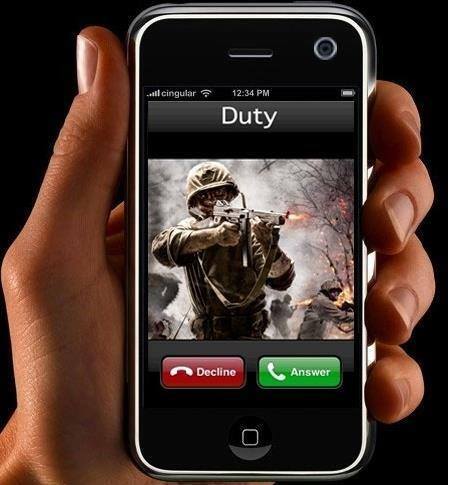 That’s right, Infinity Ward is on the case. We’ve got a few things to share with you today about the new game. Among them are a video and some box art, just to start things off on the right foot. Check all of that out after the break. Obviously, as huge fans of this franchise, we’ll be following developments on this one very closely. So, stay tuned.